Minister, Department of Agriculture, the Marine and Food :My Department invests in extensive research in relation to badger ecology and vaccination programmes with the intention of developing a vaccination programme, with a view to replacing badger culling with vaccination when this is a practicable proposition. In this context, my Department has been collaborating for some years with the Centre for Veterinary Epidemiology and Risk Analysis (CVERA) in UCD and with DEFRA in the United Kingdom on research into a vaccine to control tuberculosis in badgers and to break the link of infection to cattle. Research has demonstrated that oral vaccination of badgers in a captive environment with BCG vaccine generates high levels of protective immunity against bovine TB. Field trials are also being undertaken at present, involving the vaccination of several hundred badgers over 3 to 4 years, with continuous monitoring of the population to assess the impact of the vaccine on the incidence of disease in the vaccinated and non-vaccinated control badger populations. Success in the field trials is designed to eventually lead to implementation of a vaccination strategy as part of the national TB control programme. As it will be some years before full results of the trials will be available, targeted badger removals will continue in the medium term. Conclusions about the success of badger removal, in terms of bovine TB levels, cannot be reached on the basis of a single year’s results. Rather, trends over a number of years have to be taken into account and it is the case that there has been a very significant improvement in the TB situation in recent years and, in particular, since 2008: the number of reactors has declined by almost 50% from around 30,000 in 2008 to 15,600 last year, which represented a 15 % reduction on 2012 levels. This is a new record low since the commencement of the eradication programme in the 1950s and, for the first time since the programme was introduced in the 1950s, eradication is now a practicable proposition. The improved situation has also resulted in a significant reduction in expenditure on the TB eradication scheme, which has fallen from €55 m in 2008 to €30 m in 2013. While it is difficult to quantify the precise impact of badger culling on the reduction in the incidence of TB in Ireland over the past 10 years or so, my Department believes that much of the improvement is in fact due to the badger removal programme. In this regard, it is noteworthy that a recent peer-reviewed study, Bovine tuberculosis trends in the UK and the Republic of Ireland, 1995–2010 (Abernethy et al., 2013), published in the Veterinary Record, found that, during the period studied, the animal incidence of TB increased by 380% in England, by 190% in Wales and by 74% in Northern Ireland. On the other hand, the animal incidence in Ireland fell by 32% in the same period (and by a further 20% since the study). 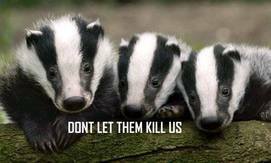 Significantly, the removal of badgers is not practised in England, Wales or Northern Ireland. The badger removal policy was introduced in light of research conducted over the years by the Department and others which demonstrated that the eradication of Bovine TB is not a practicable proposition until the issue of the reservoir of infection in badgers, which is seeding infection into the cattle population, is addressed. Capturing of badgers is not permitted during the months of February and March (the breeding season) in new capture areas. It is not proposed to extend this period to May. With regard to the badger population, a complaint by the Irish Wildlife Trust that badgers in Ireland were under threat was dismissed by the Standing Committee of the Bern Convention which noted Ireland’s badger population is not being threatened and that badger numbers are being maintained at safe low levels. While estimating wild animal populations is a difficult task, current estimates are that badger numbers in the Republic of Ireland are in the range of 70,000-90,000. In addition, even in those lands where badger populations are being controlled, the local density of badgers is on a par or greater than the norms found on mainland Europe. Furthermore, Department sponsored research in collaboration with Teagasc is being finalised that concludes that badgers in Ireland are abundant everywhere and not under any threat of extinction. This research will be published shortly when it has completed the peer review process. I propose to take Questions Nos. 791, 802 and 809 together. Under the provisions of the Greyhound Industry Act, 1958 the regulation of coursing is chiefly a matter for the Irish Coursing Club (ICC) subject to the general control and direction of Bord na gCon, which is the statutory body with responsibility for the improvement and development of the greyhound industry, greyhound racing and coursing. The ICC has a system of regulation in place to underpin standards in coursing. Under the terms of the Wildlife Acts, a licence is needed by the ICC, covering their affiliated coursing clubs, if they wish to capture or tag live hares. The Minister for Arts, Heritage and the Gaeltacht, under section 24 of the Wildlife Act 1976, has responsibility for the issue of an annual licence to the ICC and its affiliated clubs to capture live hares. These licences currently have a total of 26 conditions attached to them. Conditions of the licences cover a range of items, including provision of data on hare captures and releases, not coursing hares more than once per day, not coursing sick or injured hares, etc. The ICC ensures that a veterinary surgeon and a control steward are present at all coursing meetings. In addition to this, veterinary staff from my Department and rangers from the National Parks and Wildlife Service (part of the Department of Arts, Heritage and the Gaeltacht) carry out random monitoring inspections during the coursing season to verify compliance with the licences and the rules governing animal welfare. As a further control, a Monitoring Committee on Coursing was established during the 1993/94 coursing season and is comprised of officials from my Department and representatives from both the National Parks and Wildlife Service and the ICC to monitor developments in coursing and in that regard the situation is kept under constant review to ensure that coursing is run in a well controlled and responsible manner in the interest of animal both for hares and greyhounds alike. A very high proportion (98.09%) of the hares captured for hare coursing were returned to the wild at the end of the 2012/2013 season. The matters that you have brought to my attention will be considered at the next meeting of the Monitoring Committee on Coursing. 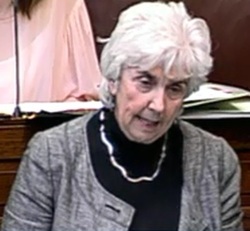 Acting Chairman (Deputy Bernard J. Durkan): Nos. 13 and 14 are related and may be discussed together. In page 15, to delete lines 15 to 17. 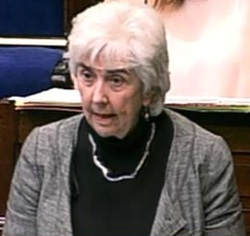 Deputy Maureen O'Sullivan: I am appalled that in the previous vote only 14 of the 120 Members in this Chamber today voted in favour of banning fur farming. When it became known in animal welfare circles that the Minister was working on this Bill, there was a great sense that finally we were going to do the right thing and that cruel practices such as hare coursing, the gassing of mink and the culling of badgers would finally be eradicated. I want to go back to the beginning of the Bill. In the Long Title, on page seven, it is definitely stated that the aim of the Bill is to prevent cruelty to animals. Under Part 3, which is entitled "Animal Welfare", on page 13, it is stated that a person who is in possession of a protected animal must ensure that the animal is treated in a manner that safeguards the health and welfare of the animal and does not threaten the health or welfare of the animal or another animal. Nobody can tell me that coursing is the sort of activity in which the welfare of the animal is not at stake and in which there is no cruelty. I refer to an interesting quotation from a German philosopher, Immanuel Kant: "He who is cruel to animals becomes hard also in his dealings with men. We can judge the heart of a man by his treatment of animals." Irish men are not coming across very well when we see the way in which animals are being treated in this country. I do not think it is doing our international reputation any good to be one of three countries that continue to allow live coursing. I understand that The Gathering has also removed hunting from its website. This was a golden opportunity to get rid of hare coursing. It is obvious that the majority of people in this country totally oppose it. I know that Deputies are annoyed by the volume of e-mails they receive on this matter, but this shows the extent of the support for putting a ban on coursing. Damage is being done to greyhounds, who are gentle animals. They are being deliberately blooded and trained to do something that is against their nature. 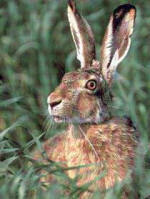 We know also of the damage to hares in the way they are netted, housed and used. There is also an increasing use of rabbits. Greyhounds have suffered injuries because they become frustrated with wearing the muzzle. As I said on Committee Stage, I do not advocate that muzzles should not be used. However, it is unnatural for the greyhound. The Minister referred on Committee Stage to employment in the coursing industry. However, employment can be supported if drag coursing is introduced. Like Deputy Daly, I hope the Minister can consider its introduction. To have coursing events monitored by coursing clubs is not an adequate supervision and inspection system. The hares are injured during coursing. They are mauled and some of them have been killed either during or after the coursing. The hare is a sub-species of the mountain hare. There could be issues with regard to the survival of the species, which may become endangered. My predecessor, the late Tony Gregory, tried to bring in a ban on coursing in the early 1990s but was unsuccessful. More than 30 years later, we are in the same situation. This is a cruel practice. If the Minister is concerned about animal welfare he will reconsider. Neither Deputy Daly nor I will give up the fight on this one. Deputy Patrick Nulty: I am happy to support this amendment. We had a discussion about language when dealing with the previous amendment. However, I do not think there can be much debate about this amendment. Hare coursing is deliberately cruel and unnecessary. As Deputy O'Sullivan has outlined, issues of employment can be addressed in other ways, such as by the use of drag coursing. It sticks out like a sore thumb in this Bill that the opportunity to ban coursing is not being seized. I wonder why it is not being seized. It is very ironic that in our vote on the previous amendment, Fine Gael, Fianna Fáil and Sinn Féin all stood shoulder to shoulder. Not since before 1918 have the nationalist parties stood together so much to oppose progressive measures towards achieving animal rights. This is an opportunity for the Minister to redeem himself. I acknowledge the positive elements of this Bill but this provision is a significant anomaly. In failing to ban hare coursing we have failed to seize political responsibility and responsibility for the environment in which we all live on this island. It is a completely barbaric, unnecessary and unacceptable practice. It certainly does not represent the future of Irish economic and rural development. We should ban it outright today. I support the amendment. Deputy Maureen O'Sullivan: I will not take two minutes as there is no point in repeating the figures Deputy Clare Daly was starting to give. However, one cannot say that the previous vote and the votes that will take place on these amendments represent a victory for democracy. It is a victory for a party system, vested interests of which want to maintain these particular industries. Deputy Mattie McGrath: I have no whip. Deputy Maureen O'Sullivan:It is not democratic. I am totally committed to democracy, but that was not an exercise in it. Deputy Mattie McGrath:What else was it? Deputy Maureen O'Sullivan: We are talking here about deliberate cruelty. I am not against what happens in the countryside in the natural course of things with animals. With a name like O'Sullivan, I have very strong rural connections. While I can accept what happens as part of the natural order in the countryside, this is deliberate cruelty. One almost feels like saying that if a hare survives once, he should receive a big "X" on his back so that he does not have to face the greyhounds in the ring the next time. It is a cruel practice and we will keep going on it. Deputy Clare Daly: There are hugely important issues here. The point about the previous vote is that there is no way only 14 Deputies are opposed to fur farming. The next vote result will be similar. We know from speaking to Deputies from all parties who voted against our amendment that it is not their personal viewpoint. I doubt many people choose to vote for a candidate based on attitudes to hare coursing or general animal welfare issues. It may be a factor for some people but it is not the most decisive factor for others. It is not an argument that stands up. Only a small number of people participate in the activity. We are all for individual freedoms and supporting individual rights. It would be fine if no harm was being done, but harm is being done. This is deliberate and barbaric cruelty that serves no purpose and does not offer a single job. Deputy Mattie McGrath may not have heard correctly because we did not say jobs would be lost as a result of this. No scientific evidence has been put forward to say a ban on hare coursing will diminish the jobs in the area. A more valid argument is that the more humane and acceptable alternative, drag coursing, could lead to more jobs being created in the industry. The majority of counties may begin to look at it if it is so great. I do not think it will happen but there is no evidence that jobs will be affected in this way. I do not accept that this is about idealism. It is about a civilised society moving on and recognising that it is unacceptable that inherently cruel practices, which do not occur in the wild or naturally, are put forward in the name of sport and entertainment. Assuming the Minister does not hear our pleas this time, we will return with new Private Members' Bill and other legislation in the lifetime of the Government. There is no way we can allow this to continue. (c) that only certified chemicals and processes be used to kill and eradicate animals used for the purposes of fur and ones which are environmentally friendly and do not risk contamination, pollution or adverse effects on the surrounding natural environment.”. We debated this issue on Committee Stage. There are two aspects to it, the first of which relates to fur farming per se. Many of us have made known our views and how opposed we are to fur farming. At this stage many countries in Europe have banned fur farming, the latest being the Netherlands, the third largest fur producer after China and Denmark. We also see a phasing out of fur farming in other countries and that would have a been a sensible approach to take here. I also discussed before the way animals are gassed. The second part of my amendment relates to the welfare of the mink. The Minister says he wants greater regulation, so fur farming will not be banned in this Bill. Therefore, there is a need for much stronger controls over how the mink are held and how they are gassed. As I pointed out on Committee Stage, there are serious issues for the environment. Fur has a higher impact in respect of 17 of the 18 environmental themes, including climate change and toxic emissions. The climate change impact of 1 kg of mink fur is five times greater than that of the highest scoring textile wool, owing to the feeding requirements and the nitrous oxide emissions from mink manure. There are two issues in question here. I would love to see fur farming banned and do not understand why we must retain it in this day and age. We could follow the good example of other countries in Europe and even if we do not ban it outright, consider phasing it out. In the meantime, we must show more concern for the welfare of the mink while they are being kept in captivity and about the way they are gassed. There is also an issue with regard to mink escaping from captivity and damaging bird life in their area. Deputy Simon Coveney: We had a good discussion on this on Committee Stage and while I am trying to accommodate people's concerns, there are some things we cannot do. Deputy O'Sullivan wants fur farming banned, but what I propose to do is to introduce a new code of conduct and a new inspection and licensing regime in order to reassure people that within the boundaries of farming, the welfare of the animals is protected. This goes for matters such as the density of animal numbers in cages and the way in which they are killed. I will bring that code before a committee and we will be able to discuss it. However, I cannot agree with the Deputy that we should simply ban fur farming. We will introduce a tight code of conduct and a new licensing regime and if it is necessary to introduce regulations, we will do that. However, let us wait and see how the code works. This is a practice that is relatively small in Ireland and there are only four or five fur farms here. I want to ensure that the fur farming that takes place here is of the highest standard. If at some point in the future, we need to review that because of welfare standards or concerns, we can do that. However, we have taken a policy decision not to do that at this stage, but to focus on ensuring that welfare concerns are properly attended to. Deputy Clare Daly:I support Deputy O'Sullivan's amendment. I appreciate the point made by the Minister that he will look at this issue in the form of a code of conduct, but the problem for us is that what we are dealing with currently is an Animal Health and Welfare Bill where this practice, which is inherently cruel and inhumane, will be allowed to continue, while we are expected to buy into a promise of regulation and improvement. Given the thorough knowledge the Minister has of his brief, I am sure we will be given regulations and that we will have an improvement on what exists now. The problem is that we have no input into that process. However, we have an input into this Bill. In that sense, the moving of this amendment is appropriate. 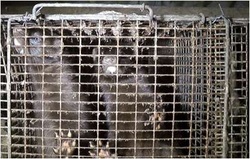 Fur farming is a small scale practice here and is not of major significance. Often, the argument is put forward that there are serious economic considerations with regard to the need to practise this barbarity. That is not the case here as we are talking about just five registered mink farms, yet in 2006 approximately 170,000 mink were being killed here and 300 foxes. There are issues with regard to the type of regulations the Minister intends to introduce. In Germany, there have been substantial improvements in regulations and while it has not banned the practice of fur farming, it has upgraded significantly the quality of life of mink. That is somewhat of a contradiction as mink do not have much of a quality of life, but at least they are being kept in better cages and are given some form of toys, better food and wire mesh floors have been banned. We have no such guarantees with regard to the issues here or in terms of the manner by which the animals will be killed. I would prefer an outright ban on fur farming as that is the only choice that is compatible with animal health and welfare, because the idea of keeping the practice of keeping and rearing animals just for their fur has no logical basis. While the Minister said previously that there are currently no foxes being farmed in Ireland for their fur, there is nothing in the legislation which prevents this from happening in the future. We need more and this amendment gives us more and that is the reason I support it. Deputy Patrick Nulty: I too support Deputy O'Sullivan's amendment. The Minister has admitted that fur farming is a very small operation here. This begs the question why we do not seize the opportunity today to put an end to this barbaric practice. This barbaric practice does not represent the future of rural economic life here. Fur farming is on the decline, is unnecessary, deliberately cruel, wrong and profoundly unnecessary. There is no need or justification for it. I am very interested in hearing what the Minister has to say on this. Why does he not take the opportunity today to be the Minister who brought in a ban on fur farming? Why does he not accept Deputy O'Sullivan's amendment and do a good day's work in the House? Deputy Simon Coveney: I hope I will do a good day's work in the House. It is true there are only five fur farms. However, it is not true to say this practice is deliberately cruel. This is a farming practice and like poultry or some pig farming, it is an intensive practice. I am not overly supportive of the industry, but I do not feel I should ban it. Quite a number of people here make a living from work linked to the five existing farms. If we banned fur farming, we would have to compensate these people. I have thought about this issue and considered banning fur farming, but on balance I believe better regulation is a fairer approach to take for the people in the industry. As legislators, we must ensure we apply best practice so as to ensure welfare considerations are focused and that we put a code of conduct and licensing system in place that will reflect that. If this code and system make the industry uncompetitive, so be it. I am slow to ban outright something that I am personally not that comfortable with, but that is far different from deciding to ban something. I believe this industry has a right to survive and deserves a policy response that allows it do that. However, I have a responsibility to ensure that within that, we impose welfare standards within reason on the industry. We will do and will bring the code of conduct to committee where I suspect the Deputy will have an input into it. The Deputy should wait and see what we do in that regard. One of the first things I did when I became Minister was to ask for a report on fur farming. I received that report and it makes a series of recommendations. Some Deputies have probably read the report, but the recommendations may not go far enough for them. It is a step in the right direction and we will now move ahead to put a code of conduct in place. Let us see then in five years' time where we are with this industry. Deputy Simon Coveney: What I said is that it is not deliberately cruel. People do not set out deliberately to be cruel. Deputy Maureen O'Sullivan: I know, but if animals are to be gassed with carbon dioxide, that is cruel. It has been scientifically proven that cruelty and pain are involved for these mink. The Irish Wildlife Trust's report on mink farms, which was covered on television some time ago, pointed out the dreadful conditions that exist in such farms. I accept that the Minister has said he does not intend to ban this industry outright, but I would have expected him to consider phasing it out as other countries are doing. Deputy Simon Coveney: There are other countries that are not doing that. This is a policy choice. We have decided to ensure Ireland acts as an international benchmark in prioritising welfare standards. We will ensure the standards in this industry are as high as the standards in any other country, if not higher. We will do that through a code of practice and a licensing system. That is the approach we have decided to take. There are recommendations and European standards relating to how animals should be killed. It is important to emphasise that there is no farming system that does not involve some pain when animals are slaughtered at the end of their lifetimes. I do not know whether the Deputy has ever visited a slaughterhouse at which poultry, pigs, sheep or cattle are killed. This is part of farming. We need to apply standards that ensure the suffering of these animals is minimised at the time of death, just as we have done in the case of other farmed animals. We will try to do that through the code of conduct on how animals are killed at the end of their lifetimes. The Dáil divided: Tá, 14; Níl, 106. Tellers: Tá, Deputies Maureen O'Sullivan and Clare Daly; Níl, Deputies Paul Kehoe and Emmet Stagg. Minister for Agriculture, Food and the Marine (Deputy Simon Coveney): Under the provisions of the Greyhound Industry Act, 1958 the regulation of coursing is chiefly a matter for the Irish Coursing Club (ICC) subject to the general control and direction of Bord na gCon, which is the statutory body with responsibility for the improvement and development of the greyhound industry. The ICC has a system of regulation in place to underpin the maintenance of standards in the sport. The Minister for Arts, Heritage and the Gaeltacht, under section 24 of the Wildlife Act 1976, has responsibility for the issue of an annual licence to the ICC and its affiliated clubs to capture live hares. These licences currently have a total of 26 conditions, including welfare aspects, attached to them. A very high proportion (97.3%) of the hares captured for hare coursing were returned to the wild at the end of the 2011/2012 season. Minister for Arts, Heritage and the Gaeltacht (Deputy Jimmy Deenihan): The control of live hare coursing, including the operation of individual coursing meetings and managing the use of hares for that activity, is carried out under the Greyhound Industry Act 1958, which is the responsibility of the Minister for Agriculture, Food and the Marine. 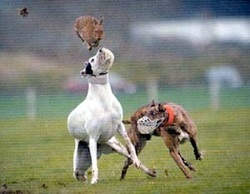 Hare coursing is administered by the Irish Coursing Club, which is a body set up under the Greyhound Industry Act 1958. One condition of the license issued by my Department to the Irish Coursing Club requires that all hares must be returned back to the wild once the coursing meeting has concluded. I understand, however, that a Galway & Oranmore Coursing Club meeting originally scheduled has been postponed due to unsuitable ground conditions and accordingly the requirement for release following conclusion of a meeting does not arise at this time.